Experience Still Changes Everything | MND GMZ MINISTRIES: Reclaiming the Rules, Finding Identity in Christ. So I might be obsessed with Mat Kearney. But I don’t believe it is entirely unhealthy. I’ve loved his music for over ten years. 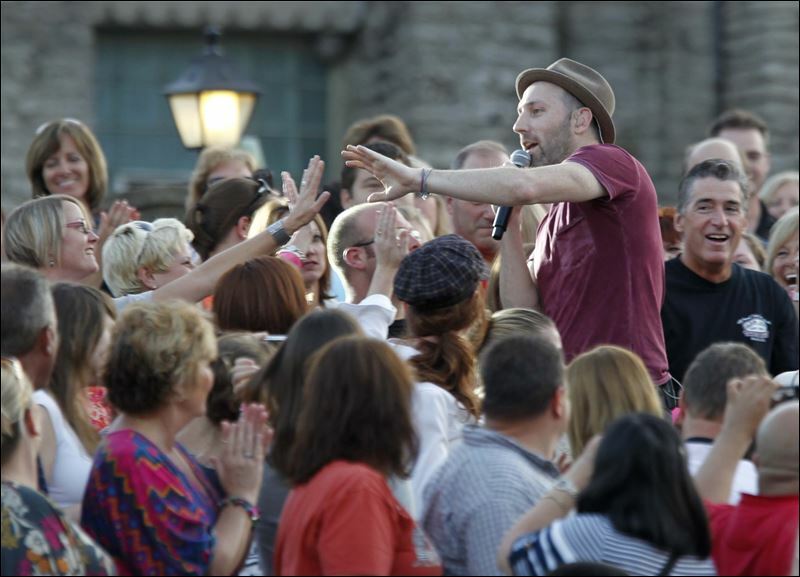 Three years ago I wrote this blog about my first Mat Kearney concert. A year ago I re-posted it after my second Kearney concert. Now I’m reposting it for a third time after my third concert. I can’t help it…I just really like him, the music, and the lessons I learned as a result. This concert was different from others – although isn’t that always the case? No two concert experiences are ever the same. My friend purchased the tickets and we were well aware it was general admission. What we foolishly did NOT realize until we arrived was that it was an OUTDOOR concert. Oops. A lesson originally learned at my first Mat Kearney concert is that you should never be an observer. No, it is important to be a participant. And so in true form, my friend and I made our way to the front (and as you can see from the pictures that follow, we did pretty well)! Thankfully GORGEOUS weather made an outdoor concert a welcome surprise. The heart is courtesy of my 23 year old googly eyed, smitten compadre. And just as we got settled in for the show, I heard someone call my name. I turned around to find my beautiful cousin and her husband sitting right behind us! It wasn’t long before my friend also ran into treasured friends and had an opportunity to reconnect with them as well. So…incredible music, incredible friends (and even family!) made for incredible memories. So what are the lessons? Life is sweetest when shared with others. Music moves us but live music connects us and moves us together. Whether family, dear friends, or complete strangers, for a few hours we sing the same songs in a shared moment that simply cannot be replicated regardless of how many dates are on the tour. We really are better together and life is sweeter experienced in community with others. Individual experience matters, but shared memories are magical – they have the ability to deepen relationship, develop intimacy, and pave the way for authenticity. And yet, in the midst of the shared experience, we also maintain our unique individuality. Each as their own favorite song, their own reason for why it is their favorite, and their own unique way to take in the moment. Some sing along as loudly as possible – forgetting those around them came to hear the artist on stage instead of their out of tune rendition (I may be a singer…guilty as charged). Others close their eyes and quietly take in each note. Some stand. Some sit. Some fight to the front. Some retreat to the back. So honor one another’s unique perspective and experience, for even if you had the same experience, it is still uniquely yours and different from someone else’s. The original lesson learned so long ago? It is good to observe, it is MUCH better to actually experience. Below is that original post. I hope you continue to read and find the same courage to attend a concert or two (both literally and figuratively) and to move to the front where you can experience and participate. Rachel – thank you for helping me learn to fight to the front, hold my ground, sing at the top of my lungs, and truly experience.